MLPs – True Value or Value Traps? Since oil prices begun dropping in July 2014, Mid-Stream Oil and Gas MLPs have been taking a beating, along with the rest of the energy sector. Additionally, these MLPs have been whacked by rising interest rates. The combination of rising interest rates and falling oil prices has cause these MLPs to perform very poorly. The cautious path for an investor to take would be to stay away from any MLPs related to oil and gas at given this unfavorable environment. But the hunter in every investor may be looking for bargains that can weather this storm and perform well in the future. However, there is the real worry that it could be a very long storm as low oil prices and higher interest rates may be here to stay. Given this backdrop, investors should rightly ask; are MLPs as currently priced, bargains or value traps? I will argue that most MLPs are currently value traps, with a few exceptions, because of rising interest rates and the negative outlook for oil. 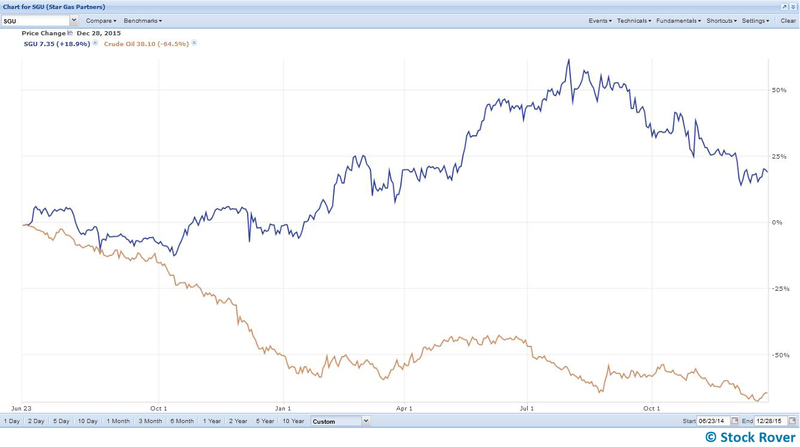 I have found a small crop that has outperformed their peers since the oil price drop began and I will offer some insight about what they’re doing right, which we can later use to help us identify the MLPs that are more likely to be bargains than value traps. First, for those who aren’t familiar with MLPs, allow me to quickly introduce you. Then we’ll dig into the true value/value trap question. Are MLPs Bargains or Value Traps? Master Limited Partnerships (MLPs) are publicly traded limited partnerships normally composed of a general partner and a limited partner. The general partner manages the day to day operations of the MLP while the limited partner provides the capital. Investors (the limited partners) in MLPs buy units, as opposed to shares, and are called unitholders, as opposed to shareholders. The limited partner is paid cash distributions instead of dividends. The structure of an MLP looks very similar to that of a corporation—general partner would be management and the limited partners would be shareholders except for the fact that that there are often two legal entities and not one. Most people use shareholders to describe unitholders or dividends when they mean distributions from force of habit, I may at times do the same. If the MLP structure is similar to that of corporations, why do companies choose to be MLPs instead of just being a corporation? Although there are many reasons, the main one is taxes. MLPs, unlike corporations, do not pay income taxes thus MLPs avoid the double taxation burden of corporations while retaining the desirable characteristics of the corporations such as liquidity from being publicly traded. Simply put, MLPs are attractive to investors because unitholders only pay taxes once i.e. when they receive distributions unlike shareholders who pay taxes first at the corporate level and again when they receive dividends. But not all companies can be MLPs because the IRS requires that a company receive 90% of its revenue from real estate, natural resources and commodities, MLPs are restricted to those industries. In this article, I am focusing on Midstream Oil and Gas MLPs i.e. MLPs involved in the transportation and storage of oil and natural gas. For more details on MLPs and what investing in them entails, see this article. The main drawback of MLPs is a flipside of the main benefit: because the unitholders are individually responsible for paying taxes—since MLPs do not pay income tax—filing taxes can be complicated. In addition to the feared Schedule K-1 tax form, the drawback is compounded if the MLP operates in multiple states because the unitholder has to file taxes in all those states where the MLP operates. Note that I did not try to separate out which tickers are actual MLPs, which are general partners, and which ones are limited liability partnerships (for now at least) because there is a lot of restructuring with MLPs—resulting in a lot of confusion about who’s who. Business segments are spun off into separate companies; new limited partnerships are formed etc. For example, Enbridge Energy Partners (EEP) is the actual MLP, Enbridge Energy (EEQ) is a limited liability partnership holding units of Enbridge Energy Partners (EEP) while Enbridge Energy Company Inc. is the general partner. Confused yet? You see my point. 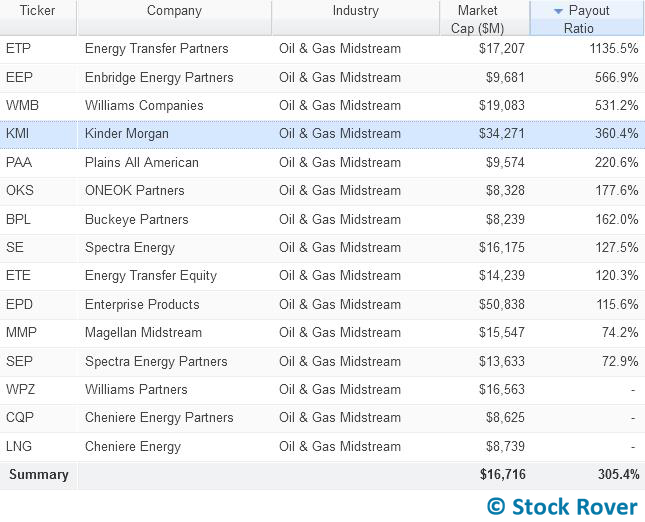 So in spite of the oil downturn, 4 out of 67 companies have managed to beat the oil and gas midstream industry, outperform the energy sector and top the S&P 500. Let’s pull these apart and see if we can account for their strong performance. In addition to being indirectly exposed to oil prices, EQM has been shielded from the oil glut by firm contracts. Firm contracts are agreements for transportation or storage services that generally obligate customers to pay fixed monthly fees to reserve a certain amount of pipeline capacity regardless of the actual capacity used a by consumer. In Q3 2015, fixed charges under firm contracts (also known as firm reservation fee revenues) accounted for 82% of total revenues and increased 25% YoY. The effect of falling oil prices on EQM can be seen in volumetric based fee revenues i.e. fees charged on gas volumes transported in excess of the capacity purchased under a firm contract which declined 24% YoY. Low exposure to oil prices and firm contracts are the two main reasons why EQM has outperformed its peers and the main benchmarks. Insight: Have low exposure to oil and sign firm contracts. Low oil prices translating into cheaper input prices are the reason SGU has managed to outperform the oil and gas industry, the energy sector and the S&P 500. 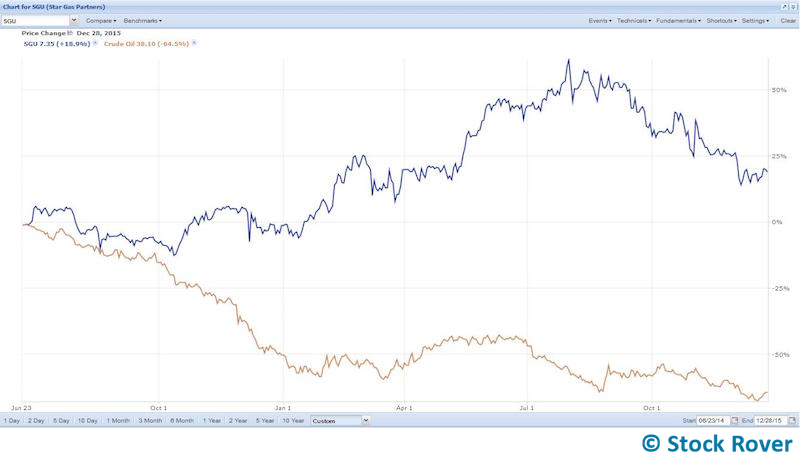 However, SGU’s outperformance has been checked by falling natural gas prices and rising natural gas consumption. Insight: Have oil as an input so that its price fall at least reduces your operating costs. TEP is a midstream oil and gas MLP. It has both crude oil and natural gas transportation services consequently it has both direct and indirect exposure to oil prices. In the nine months ended of 2015, TEP’s revenues from crude oil transportations services accounted for 53.5% of total revenues while natural gas transportation services accounted for 23.5% of total revenues. While TEP has more exposure to crude oil prices than natural gas prices, it should be noted that crude oil exposure in 2014 was 0. The 53.5% increase was the result of the TEP’s acquisition of interest in the Pony Express Pipeline. Because TEP did not have any oil exposure prior to the oil downturn, any revenues it got from oil increased its total revenues. Essentially, TEP missed the oil slump (or management had perfect timing) because it acquired Pony Express in July 2014 right when the oil decline began. Consequently, TEP has been able to outperform its industry, sector and the S&P 500 not only because of the increase in natural gas consumption but also because it did not get into oil before the downturn. Insight: Miss the oil slump (or have management with perfect timing). 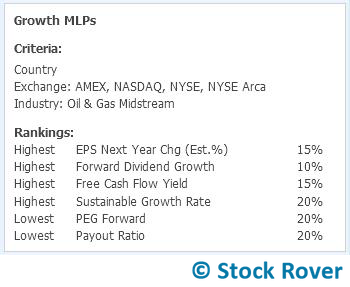 VLP is a midstream oil MLP. Like SGU, VLP has direct exposure to oil prices because it owns and operates crude oil and refined petroleum products pipelines, terminals and transportations assets. Because of the oil exposure, VLP has been negatively impacted by the fall of oil prices. For instance, in Q3 2015, VLP pipeline transportation revenues only rose 3.5% compared to 24.7% in Q2 and 30.5% in Q1 of 2015. However, that hit in revenues has been offset by fixed monthly storage fees that Valero (its main customer) has to pay regardless of whether it uses the storage or not. Additionally, quarterly deficiency payments mean that VLP gets paid even if its customer does not meet the minimum quarterly throughput (the volume of oil that a client agrees to transport through a pipeline or terminal each quarter). Although the quarterly deficiency payments can be applied as credits in periods of excess throughput, they are only valid for a year. Like EQM, VLP has benefited tremendously from fixed charges. Additionally, like TEP, VLP has profited from making acquisitions right when oil began to tank; for example, VLP acquired the Texas Crude Systems Business in on July 1, 2014. Additionally, recent acquisitions like the Houston and St. Charles Terminals have only now beginning to generate revenue. Additionally, Valero began charging a terminaling fee for crude throughput delivered to its Lucas Terminal. Thus VLP has been able to outperform because of fixed fees, new fees, and new acquisitions. Insight: Sign firm contracts, miss the slump, introduce new fees, and make acquisitions. Even if rising rates did not significantly affect KMI’s current interest payments, its high payout ratio should be a concern because to sustain such payouts it has to borrow at ever higher rates whether through its credit lines or bonds. Rising interest rates also affect MLPs indirectly. As shown above MLPs tend to have very high payout ratios thus they have little to zero retained earnings to fund expansion or acquisitions. The lack of retained earnings leaves them with two options for funding growth—borrowing or issuing new units. Rising interest rates drive the cost of borrowing higher, making debt as a source of funding for growth less attractive or eliminating it altogether. That leaves MLPs one choice, issue new units. But issuing new units dilutes the distributions of existing unitholders and this is exactly what some MLPs are doing (more this later). Consequently, rising interest rates restrict growth prospects for MLPs especially highly leveraged ones. I contend that most MLPs are currently value traps, with a few exceptions, based on the insights we got from looking at the four outperformers and the industry outlook. Should investors divorce their former darlings or give them a second chance? I, unfortunately, will for the most part suggest divorce. In the carnage that the oil fall and rate hike have wreaked, I would like to think that there are MLPs that are currently undervalued and present great bargains but I would also like to be careful not to fall for value traps because value traps, essentially, are false bargains – they appear cheap but end up being expensive. 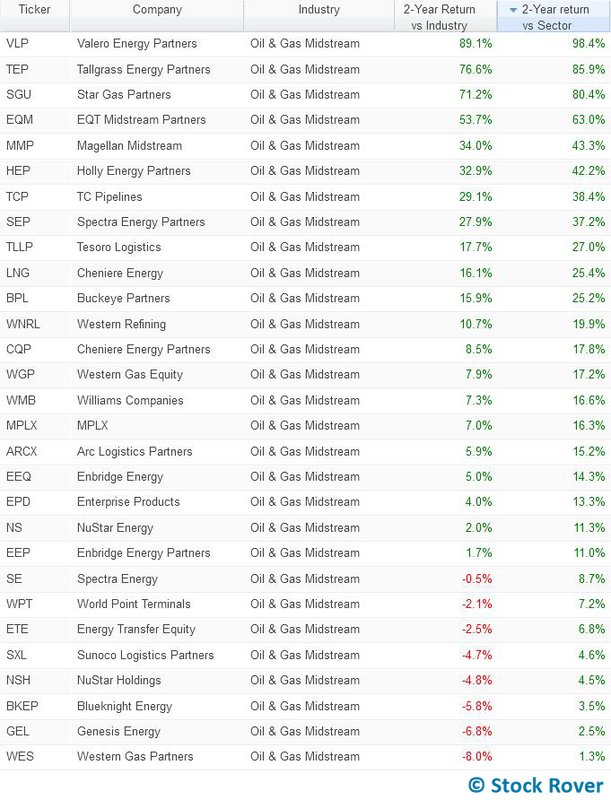 To determine which MLPs are cheap, I created a ranked screener weighted by various valuation metrics. Weights are simply percentages allocated to a particular metric out of the total number of metrics used in the screener. A higher percentage means that the screener places more emphasis on that metric compared to others. For example, in my valuation screener, Price/Free Cash Flow has a 15% weight compared to 10% for rest (except EV/EBITDA) meaning that MLPs with lower P/FCF ratios will rank higher. I placed more weight on P/FCF and EV/EBITDA because they better capture how cheap a business is (relative to the money coming in) than other metrics. Based on the 9 valuation criteria, Star Gas, Global Partners, Blueknight, Targa, Targa Resources are the cheapest. It is worth noting that Star Gas—one of the four outperformers—ranks first; so maybe there is some basis for thinking that there could be bargains in the midstream oil and gas MLP space but we need we investigate this further. Based on the 6 growth metrics, Western, Columbia, Blueknight, World Point and Boardwalk have good growth prospects. SGU, first on valuation, ranks eighth on growth prospects while Western, eleventh on valuation comes in first on the growth ranking. From all the red in the table above, it is clear that most have little cash flow left over. 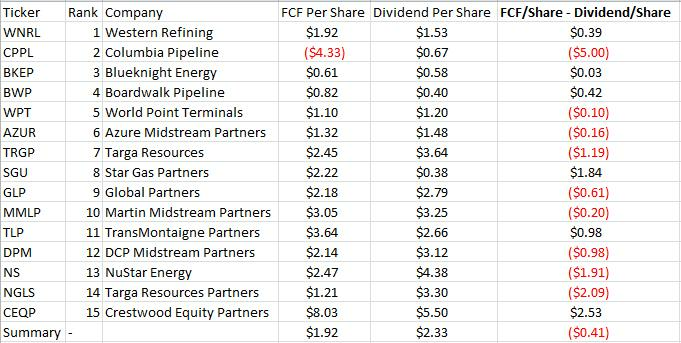 All the other MLPs except Western, Blueknight, Boardwalk, Star Gas, TranMontaigne and Crestwood, paid out more money in distributions than they had coming in. It begs the question, where is the money for future expansion or acquisitions going to come from? Before we can even answer that, where are they getting the cash to pay out more than they have coming? Many of these MLPs have large credit lines which they have used these to pay for distributions. For instance, Azure in February, 2015 had a $250 million credit line and by September, 2015, it had borrowed $225.7 million under it. With $1.32 coming in and $1.48 going out, Azure did use its credit line. Borrowings under credit lines usually carry variable interests and Azure’s line does—LIBOR Rate plus a margin of 2.75% to 3.75%. With interest rates rising, debt is becoming an expensive way to pay for growth leaving MLPs like Azure with one choice—issue new units. Azure followed this exact path; in June 2015, it issued common units and received $48.3 million for them. Issuing new units is great for the general partner but bad for unitholders as it dilutes earnings. With so many of these MLPs experiencing losses, they are diluting non-existent earnings. The next table shows which MLPs are issuing more units than they are buying back (buyback yield) and which are benefitting from issuing new units (shareholder yield). Buyback Yield is the net value of unit buybacks over the past twelve months as a percent of the current market capitalization. A negative value shows that the MLP issues more units than it purchases. Shareholder Yield is the sum of unit buybacks and distribution payments to unitholders over the past twelve months as a percentage of current market capitalization. A negative value indicates an MLP is profiting more from issuing new units than it is spending on buybacks and distributions. 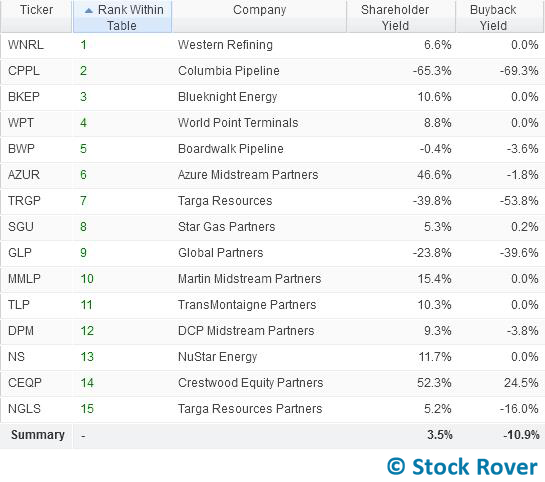 The only MLPs among the 15 that are buying back more units than they are issuing (positive buyback yield) and not profiting off issuing more units than they spend on buybacks (positive shareholder yield) are Crestwood Equity and Star Gas. A majority (7) of the MLPs are issuing more units than they are buying back (negative buyback yield) while the minority (6) are issuing as much units as they are buying. 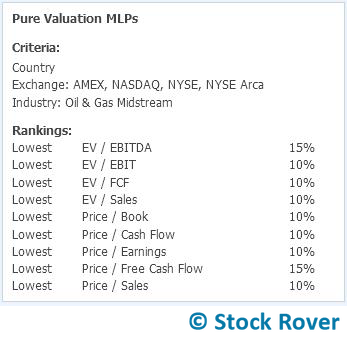 After looking at valuation and growth potential, the only MLP that seems like a bargain relative to peers is Star Gas. Although Crestwood Equity has positive buyback yield and shareholder yield and paid out less than it earned, it ranks 9 on valuation. Star Gas, on the other hand, has positive buyback and shareholder yields, it paid out less than it earned, and it placed 1 on the valuation ranking. But we cannot conclude that Star Gas is a bargain without looking at the outlook of the oil and gas midstream industry and seeing how the industry outlook will affect Star Gas. OPEC production is showing no signs of slowing after OPEC decided not to curb production on December 4, 2015 while non-OPEC production is only displaying small declines. Those small declines are partly due to falling US production in 2015. But even though US production fell in 2015, commercial crude oil inventories increased 26.4%. While the excess supply of oil might sound like good news for MLPs, after all their business is to transport oil—the more oil passing through their pipelines the better, it is not. Because of the excess supply, MLP customers are facing declining profits and falling profits prompt them to renegotiate the prices they pay for services from MLPs. While firm contracts keep the prices fixed in short term, they cannot keep them fixed in the near to long term. Additionally, firm contracts mainly apply to minimum capacity reservations. MLP customers can and have renegotiated excess capacity fees and that has resulted in decreasing revenue for MLPs. For instance, as we saw earlier in the case of EQM, revenues from excess volume fees fell 24%. 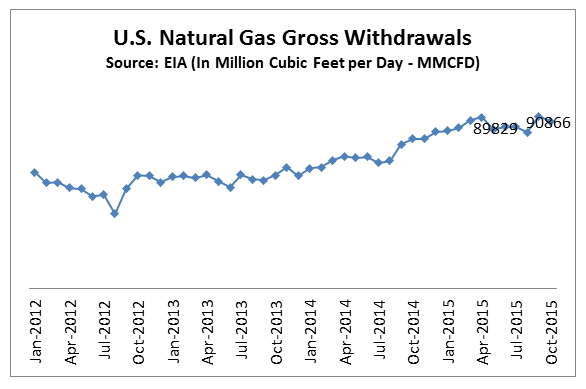 Natural gas production increased 1.2% to 90,866 MMCFD in October, 2015 (most recent data from the EIA) from 89,829 MMCFD in January, 2015. Over the same period natural gas prices have fallen and lower prices should dampen production in the near term. Although improved by recent tensions in the Middle East, the prospects of oil and gas prices rising to their 2014 highs in the near term are distant. Russia’s oil and gas production continues to rise boosted by a weak ruble (Russia is one of the largest non-OPEC producers aside from the US). 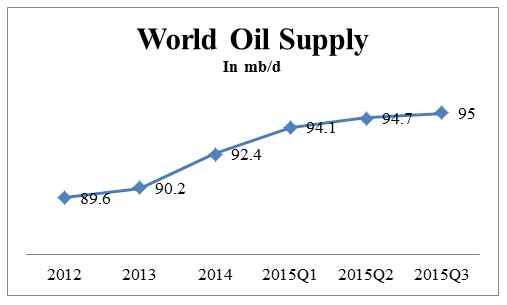 Additionally, Iran is scheduled to increase oil production this year. Concerns that the nuclear deal is jeopardy might not be warranted at this point as no new sanctions have been issued yet by the White House. Additionally, weak global demand for oil as a result of the slowdown in China will contribute to keeping oil prices low for the foreseeable near term. A low oil price outlook for the midstream oil and gas industry should generally mean that most MLPs will have falling profits as their clients reduce volume reservations and renegotiate fixed fees. However, there are exceptions. MLPs that use crude as input are one such exception. As we found out earlier when looking at the four outperformers, Star Gas (SGU) will benefit from lower oil prices because lower prices mean lower input costs for its heating oil business. But for MLPS like Western Refining (WNRL) and TransMontaigne Partners (TLP)—whose clients are oil refiners and marketers—lower prices mean lower revenues because their clients’ margins fall. The difference between SGU and WNRL (or TLP) is that SGU is selling heating oil (a product of crude oil) in addition to transportation and storage while WNRL is selling transportation and storage services to clients who sell crude oil. Blueknight, on the other hand, is only involved in transportation and storage services consequently lower oil prices will reduce its revenues as fees and volumes fall. The same goes for Boardwalk Pipeline although its revenue reduction may not be as great as Blueknight’s because it transports and stores natural gas instead of oil so the effect of lower oil prices on Boardwalk’s revenues is indirect. But Boardwalk is also affected directly by lower gas prices; it profits will fall as volumes and fees decline. MLPs like Crestwood Equity Partners that are involved in transportation and storage in both oil and gas may be severely affected by lower oil prices or they may see only margin revenue declines depending on where they get the majority of their revenue. For Crestwood, the majority of its revenue is from transportation and gathering of crude consequently low prices will reduce its revenues as has been happening. I believe that the majority of MLPs are currently value traps except MLPs like SGU that have crude oil or natural gas for an input. As we learned from looking at MLPs that have outperformed over the last two years, MLPs with limited exposure to oil are less likely to be value traps. With oil prices projected to stay low and even go lower, most midstream oil and gas MLPs will see their revenues fall. Their near term growth prospects are exacerbated by rising interest rates. Since MLPs pay out most of their earnings in distributions, they normally rely on debt to fund growth. But with rising interest rates, debt become becomes increasingly expensive and that leaves MLPs, especially highly leveraged ones, with one choice—issue new units. But issuing new units dilutes distributions which reduces unitholder value. In the final analysis, whether midstream oil and gas MLPs are bargains or value traps depends on what you think the outlook for the industry is and whether you promised your MLP till death do us part. If your calculus is that there will be a disruption in world oil supply that will bring prices up, then an MLP like Blueknight maybe a bargain for you. But I think it will be a long time before oil rises and an even longer time before it climbs back up to $100 per barrel. That makes most MLPs, save SGU and those with a similar relationship to oil, value traps. Tallgrass and Valero may have missed the price drop when they entered oil and therefore outperformed but they are in now and oil may drop further. Unfortunately, lower oil prices and higher interest rates win the near-term round.